Taipei, Taiwan –FZtech, a manufacturer and supplier of cutting edge and high quality products, is excited to introduce its corporate mascot – a delightful girl fifi. The little girl with a cute face currently shows up in iCity series of FZtech mobile accessories. She is a symbol of easy and simple lifestyle, as well as represents the product of FZtech which brings the ease of life to consumers. 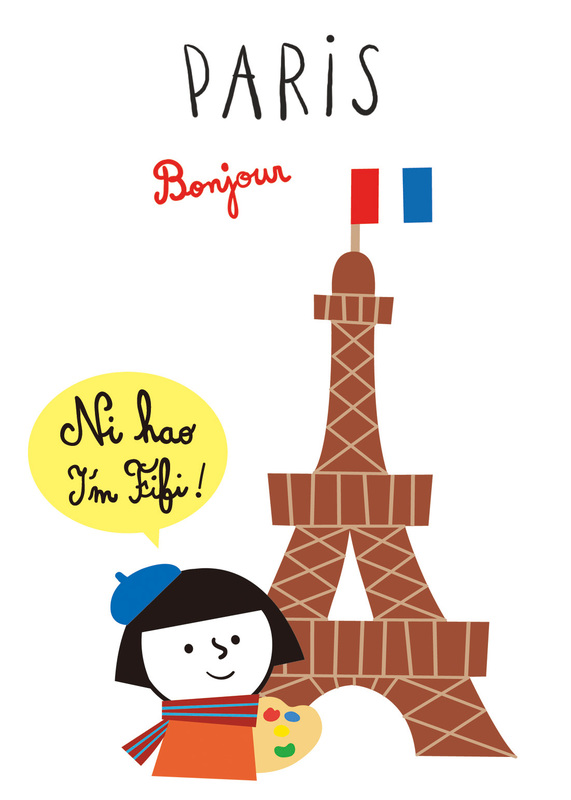 The character fifi is created by Taiwanese illustrator Yating Hung, inspired from her life in France. The story of fifi is a mirror of Yating Hung, who away home from Taiwan to France and starts her life in this stronger country. That’s why fifi said “Ni Hao!” which is the Chinese greeting means hello. Back to fifi’s story, she lives in a small apartment with a bed, a TV and a mini kitchen. Sometimes, she cooks Chinese food in her kitchen. She works in a bread store and there are a variety of bread, including croissant, bagel, pain au chocolate, baquette and the sweetest desserts. Fifi’s favorite thing is drawing and loves to draw pictures of everyday scenes. She is drawing, traveling, and lives with a simple lifestyle in France. Hung translates everything through her eyes of visions into illustration. The design of iCity series is inspired by her own impression of the cities, including Paris, London, and Tokyo, and the latest is New York City. The slogan of iCity series – A lovely tour in beautiful city, every each piece of city elements of Hung is unique and lovely. The illustration not only highlights the iCity series, but also brings sparkle to product of FZtech, making it interesting and fascinating. FZtech is excited to introduce its mascot fifi and cooperate with talent illustrator. Also, FZtech is pleased to expand its product line to consumer electronic accessories for mobiles and tablets user. As the design theory of FZtech is bringing comfort, ease and convenience to match consumers’ lifestyle and tastes, mascot fifi is perfectly match and close to consumers easily. For more information about fifi please refer to www.fztech.com.tw/fifi and Facebook: Ni Hao I’m fifi.